The 10-Watt Tower of Power. The X. Radio Free Arkansas. However you knew it, KHDX Radio has a history unlike any radio station you’ve ever heard of before. So settle in with our broadcast, scroll down, and see the history of college radio as only Hendrix College students could do it. 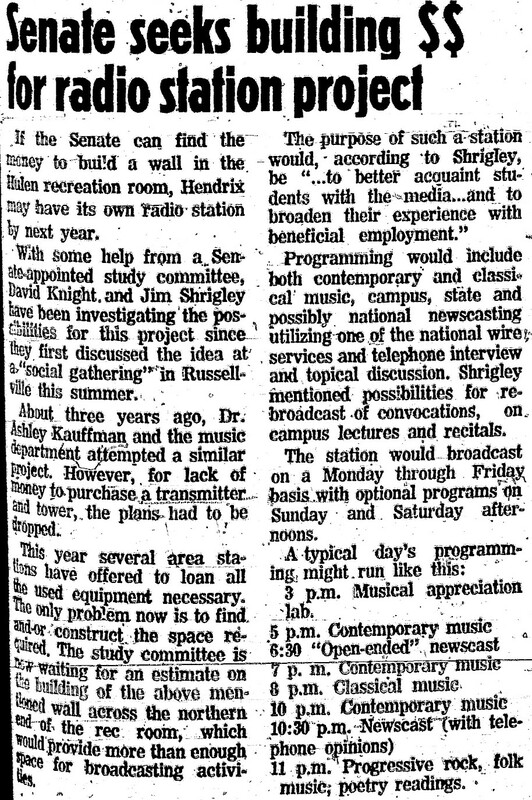 Before the letters “KHDX” had ever been assigned to Hendrix College, talk of an official radio station had been going on for years. In the 1940s, Martin Hall was known for its unofficial (and decidedly illegal by current FCC standards) radio transmissions with carrier-current stations such as KTMH, BLAB, and HRSC (which somehow stood for Hendrix Radio Speaking Station, and no, we don’t quite get it either). In the 1950s and early 1960s, however, many Hendrix students transitioned over to being a part of local station KCON, which had hours of dedicated broadcasts related to the College. This all changed in 1966, when the first mentions of an official campus radio station began to come about. However, that station idea came not from the students, but the Hendrix College Music Department, with a project headed up by Dr. Ashley Kauffman. That plan ended up not panning out due to lack of funds for a transmitter and tower, but the equipment that had been purchased so far (including an FM exciter) was in the possession of the college. 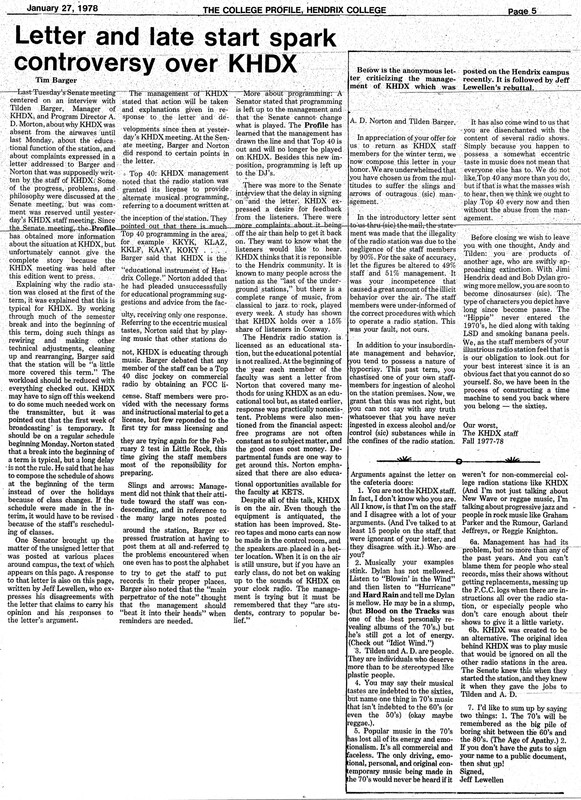 The following year, Senate formed a study committee with assistance from J.T. Shrigley and David Knight, and as 1970 rolled around, things started to fall into place for the fledgling station. Between 1970 and 1973, J.T. (alongside other Hendrix students) worked on gathering the necessary documentation and equipment to launch the station in full. By 1973, the FCC granted KHDX a full Class D operating license, and the station was considered to be official. 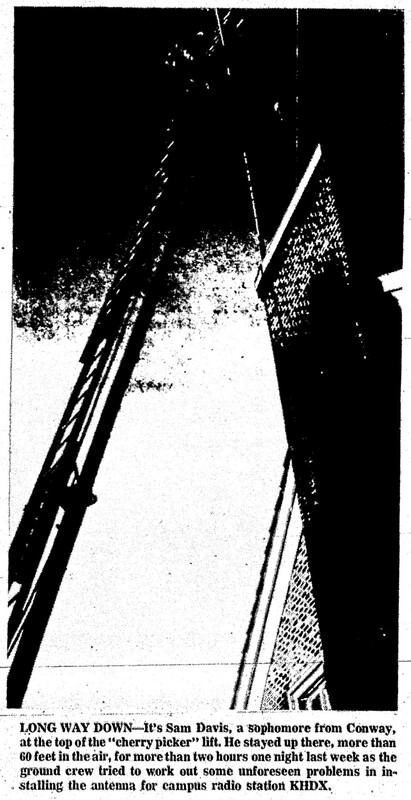 The station, while now off the ground, didn’t necessarily have the smoothest of operations. 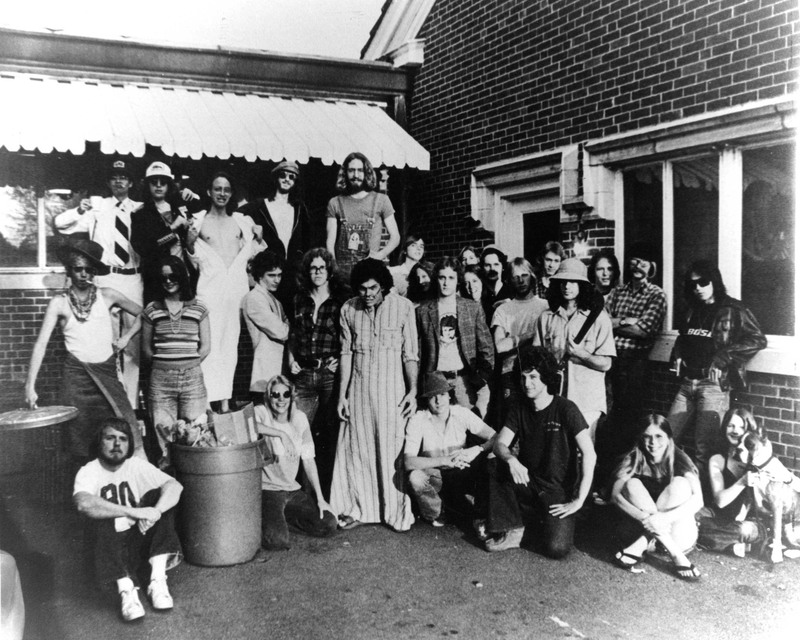 Funding for the station was notoriously paltry compared to other media organizations at Hendrix (including the student newspaper The College Profile and the yearbook The Troubadour), and in 1978 there was friction between the staff and several supposed DJs that the College Profile covered in a story. However, in true KHDX fashion, nothing was able to keep the station down, not even a change in frequency from 89.1 to 93.1 as a result of then-new 100,000 watt station KABF. 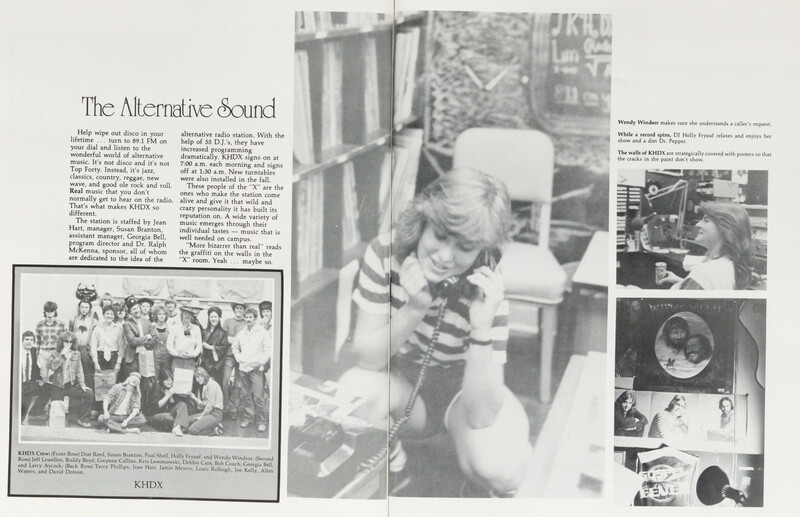 KHDX, from its inception in the 1970s, did have a singular premise that, while not explicitly stated until later in the station’s lifetime, held true regardless of the Station Manager: “no Top 40.” This rule, while controversial with the student body and subject to ridicule and parody, remained with the station, regardless of the decade (and still exists as a rule to this day, albeit in a more relaxed manner than back in the 1970s). While the 1980s passed without too much incident, the 1990s and 2000s were a much different story. It was during this 20-year time span that the station was shut down numerous times, either for FCC violations or by the decision of the staff at the time, and history of the station itself is spotty. However, as it can be seen today, the station has survived with its license intact, and you can continue to hear the station on 93.1FM or on the Internet well…here. 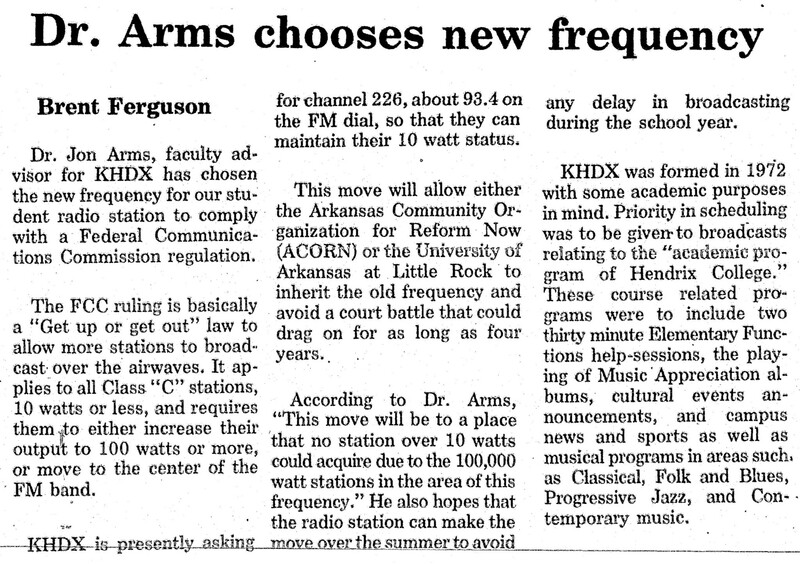 Some things haven’t changed: we’re still a 10 watt station, we still broadcast from Hendrix College, and we still (pretty much) don’t play any top 40 music. And knowing the stubbornness and determination of Hendrix students, it will likely stay that way for as long as there’s a KHDX to run. Tommy Adams was a DJ at KHDX from 1973 to 1977. He was at Hendrix at the same time as, and was a friend of, Theater Professor Danny Grace. This is a segment from one of his old shows from about 1976 called “The Rock of Ages Program with Doubting Thomas & His Dandy Dancing Disciples”. More audio will be coming soon!